Hello everyone, today I'm here for Craftie Cafe. I'm so happy to announce that I've been accepted onto the Craftie Cafe Design Team! I'm going to be making two projects every month for them with videos, which is super exciting! For my card today I'm going to be making a Mother's Day card using the Sewn With Love stamp set and also the Bannertastic stamp set by Lawn Fawn. To begin my card today I first stamped out all of the images onto some white cardstock with Memento Tuxedo Black Ink and then coloured them all in with Copic markers. Once everything was coloured I used the coordinating dies from both sets and cut all of my images out using my Big Shot machine. I set them off to the side and began work on my background. For my background I pulled a piece of watercolour cardstock and a few colours of Distress Ink. I’m using Tattered Rose, Spun Sugar and Worn Lipstick and I’m going to be doing a simple water smooshing technique. I grabbed a piece of acetate, smooshed my colour of Distress Ink on, spritzed it with a water sprayer bottle and then pressed down the acetate with the colour on, onto my watercolour cardstock and moved it around a little with the acetate. I dried it off with my heat tool and repeated the same process for all three of my colours. Once all the colours were layered up I flicked some water onto my background with a paint brush and also the nozzle out of my water sprayer bottle and then picked up the excess with a towel and dried it again with my heat tool. Since Distress Inks are reactive with water, the water pulls up a little colour creating a fun water splotch effect. Once my background was dry, I arranged all my previously cut images onto my background in a way I was happy with. 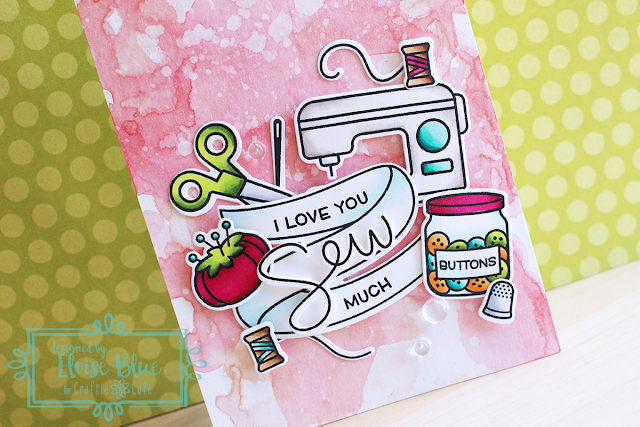 I then took the banner I had stamped and cut before and stamped the ‘I Love You’ on the top portion, curving my stamp a little to fit within the banner better and then the ‘Much’ stamp on the bottom of the banner, again curving my stamp a little to match the curve of the banner. Both of those images were stamped with some black ink and they’re both from the Sewn With Love stamp set. Now that all my stamping is done I adhered all my images with tape adhesive and also foam adhesive. Once everything was adhered down I added some Clear Droplets from Pretty Pink Posh in a trio to frame my cluster of images and that completed my card. I hope you enjoyed my card and video today and were inspired to create some Mother’s Day cards. 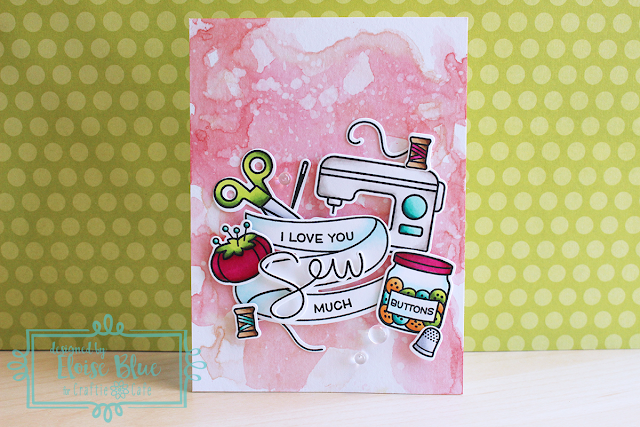 I absolutely love this stamp set and was so excited to be able to create this fun idea that I’ve had! Thanks for stopping by and I'll catch you all next time!